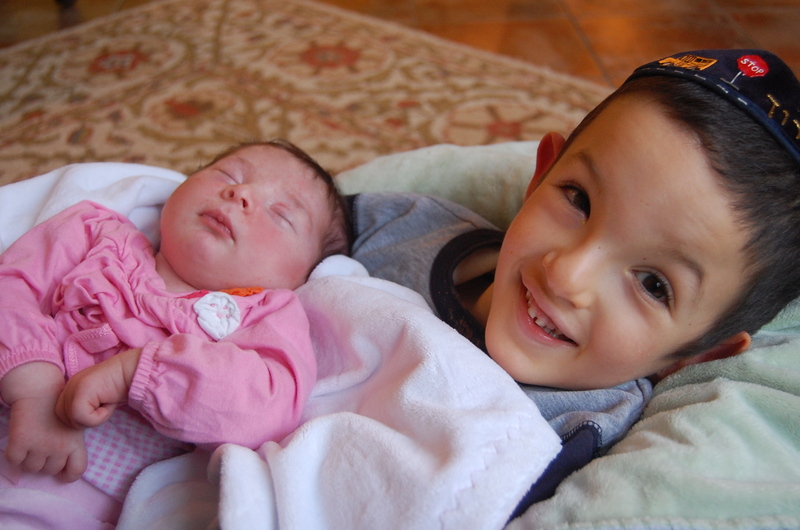 Chaim Boruch has a new Baby Sister! One may wonder why this post is so specifically in honor of Chaim boruch when usually the excitement surrounds the newborn, who is only a mere 48 hours old today. But as a mother of a special child the miracle of giving birth to a healthy child is so unbelievably more miraculous and awesome than ever felt before. I hold my new daughter in my arms and marvel at how every little detail of her incredible body is working well, nothing I take for granted. And although I know it will take time for Chaim Boruch to accept and love this new little face, I see that he has come so far already, since two years ago, when his baby brother was born. I remember the long days of inner heart ache as I could see he was trying to figure things out. I remember the long weeks it took until he would sit with me and snuggle. I rememebr the longing for Chaim Boruch to be okay, to show me a sign, to tell me that he still loves me and understands that I love him even more. So, yesterday, as I walked into our home with our new daughter, I was praying silently for his acceptance, love and smile. Nothing short of a miracle of growth and understanding….he scrambled up onto the couch and wrapped both arms around my neck and hugged me. My heart was racing and my birth of my new daughter became complete. Not just a little hint…but a huge big gorgeous sign. A sign that he would be okay…and so would I.
Chaim Boruch – these words are in your honor. You gave up so much when your soul came into this world and yet you still laugh, hug, smile and love. What a beautiful lesson to fill our home with, on the day your baby sister joined our family. Your strength is my guide. I shall follow your signs. Congratulations! I found your blog now when your second child should be almost 4 yrs old. What a lovely story to tell! May Hashem bless you and your family! ← I didn’t think a ‘Walker’ could look so Magnificent! !